The Bunraku Bay Puppet Theater will present traditional Japanese puppetry at Eastern Kentucky University on Tuesday, March 28. The program, at 7 p.m. in O’Donnell Hall of the Whitlock Building, will also include a screening of the 14-minute film, “Kaiju Bunraku,” which features the troupe’s puppetry and was one of only 68 short films selected for screening at the 2017 Sundance Film Festival from among more than 9,000 entries. In addition to a live performance of four traditional Japanese puppet pieces by Bunraku Bay Puppet Theater, Artistic Director Dr. Martin Holman and other members of the troupe will host a question-and-answer session. The event, free and open to the public, is sponsored by the University’s Asian studies program. · Kotobuki Shiki Sanbaso, a celebratory dance piece that originated in masked Noh drama. The Sanbaso is meant to purify the theater and confer good fortune on the audience with lively gestures that mimic the planting of rice and also suggest felicitous creatures like turtles and cranes. But the piece also includes comedy because even a puppet charged with the solemn task of blessing a venue sometimes gets tired and needs to cool off after a taxing turn on the stage. 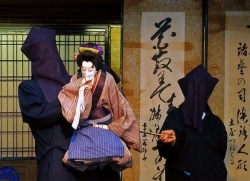 In Japan most full performances of the puppet theater open with Sanbaso, and Bunraku Bay follows that custom. · Lion Dance, a lively and engaging piece performed throughout East Asia in a variety of forms, brings good fortune to the audience – a lion bite on the head will confer intelligence on children and good health and good fortune for all. But Mr. Lion himself is not always so lucky. His slumber is often disturbed by delicate but pesky visitors. And an impertinent young woman might cause him trouble when Mrs. Lion misinterprets the girl’s actions. · Yaoya Oshichi. Oshichi, daughter of the greengrocer, must relay information and a lost sword to her lover by dawn or he will die. But on this snowy evening, she is unable to reach him with the gates of the city already secured for the night. Passing near a fire tower, Oshichi realizes that all the gates will be opened if a fire alarm is sounded. But the penalty for sounding a false alarm is death. Oshichi chooses to climb the icy tower to ring the bell, a testament of her devotion to her love. · The Dance of Ebisu. The jolly fisherman diety Ebisu brings prosperity to businesses and households as he dances along the shore and sets sail in his boat to catch the giant sea bream, the most auspicious fish in the ocean. EKU’s interdisciplinary Asian studies program offers a minor (18 credits) and a certificate (12 credits). For more information, visit asianstudies.eku.edu, or contact Director Dr. Minh Nguyen at minh.nguyen@eku.edu.